Has Hali rugs are hand-knotted in Erzurum & Diyarbakir in Turkey, using only the finest quality hand-spun wool and natural dyes. 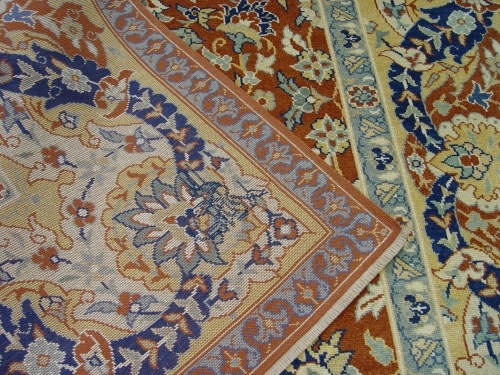 Traditional methods are used in the creation of each unique Has Hali carpet: the spinning and dyeing of the wool, the weaving, the washing process, and even the final shearing are all carried out by hand. Each piece is signed, and comes with a certificate of authenticity. Inspired by the motifs and colours found in the rich historical collections of Istanbul's museums & palaces, Has Hali perpetuates the finest traditions of hand-knotted carpet making. Has Hali Carpets have twice received (2003 & 2006) the "America's Magnificent Carpet" award, widely regarded as the most prestigious award given in the hand-knotted carpet industry. 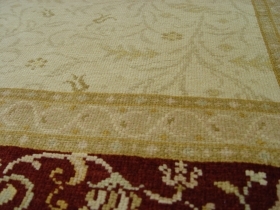 Myles Quirke Oriental Rugs is the sole Irish retailer of Has Hali carpets.